Monsignor Graham Wilkinson is our current parish priest. He was born in North Staffordshire and studied for the priesthood at Oscott College. He was ordained on 10th January 1976. His early years of ministry were spent in Birmingham, including a stretch at St Chad's Cathedral. His first appointment as parish priest brought him to Worcestershire and the delightful rural parish of Ypton-on-Severn and Blackmore Park at the foot of the Malvern Hills (do I detect nostalgia?). In 1987, Archbishop Maurice asked him to return to Birmingham as parish priest at St Peter's Bartley Green and set up a programme for the training of permanent deacons. The next ten years were devoted to developing this programme at Newman College. In recognition of this work, in 1996 he was made a Monsignor by Pope John Paul II. In 1997 he moved to Wolverhampton as parish priest of St Michael's in Penn and served as dean of the city. In 2007 he returned to Worcestershire as parish priest here at St Peter's. His twin passions are Fine Art and the Second Vatican Council and it is about these that his parishioners get more than their fair share in his homilies! Apart from his homilies, he overseen the renovation of the church and a major fundraising to carry that renovation out. The former parish priest, Fr Patrick Branagan, was appointed in December 1991 following the retirement of Fr Edmund Motherway. Fr Pat originally trained as a Dominican, but decided that his vocation rested in parish work. He served in parishes in Wolverhampton and Birmingham following his ordination in 1964 with a two year break for a Masters degree in Canon Law in Canada between 1976 and 1978. His parish ministry was coupled with service as a Canon Lawyer on the diocesan marriage tribunal for 31 years until the end of 2004. Under the leadership of Fr Pat, the involvement of lay people in the parish expanded considerably. He encouraged the growth of catechesis and youth work as well as overseeing the development of the church buildings. 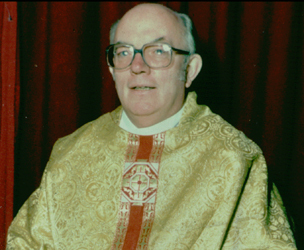 Fr Edmund Motherway died on Thursday 20 December at 3am. His Funeral Mass will be celebrated at 12noon on Saturday 22nd December at St. Mary's Church Ladysbridge, County Cork; Burial afterwards in the church grounds.His health had been failing for some time, but being 100 yrs old that is not really surprising. On 18 December he celebrated 75 years since his ordination in 1943. He was Parish Priest at St Peter’s from 1970 until his retirement in 1991. May he rest in peace.